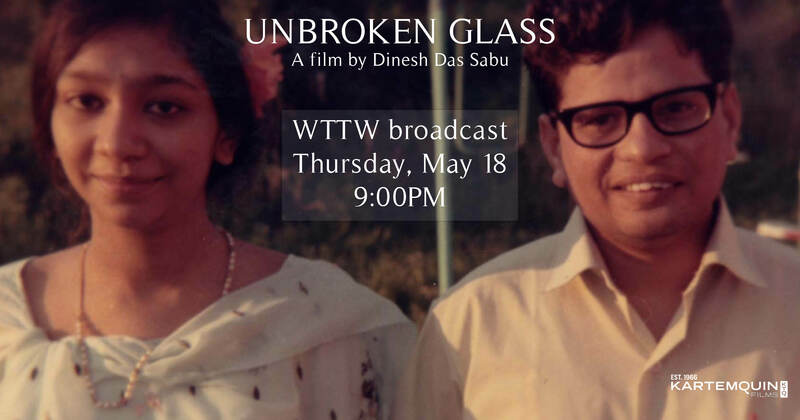 Unbroken Glass, the directorial debut of Dinesh Sabu is not slowing down. The film broadcasts on Chicago PBS' WTTW Channel 11 this Thursday, May 18 at 9PM, follow Dinesh's appearance on Chicago Tonight at 7PM. On the heels of the film's US broadcast premiere on America ReFramed this past Tuesday, Unbroken Glass is now available for online streaming on worldchannel.org as well as available for purchase on DVD in the Kartemquin store. When he was six years old, Dinesh Sabu's parents died within a month of one another. Raised by his older siblings, he had little idea who his parents were or where he came from. Through making Unbroken Glass, he attempts to piece together their story and his own–uncovering a silenced family history and disturbing truths in the process. Dinesh recently was awarded Best Director in the North American Documentary Feature Competition at the 2017 Los Angeles Asian Pacific Film Festival and had a piece published in POV's Documentary Blog entitled "On Grief and Filmmaking." Stay up to date on all things Unbroken Glass by signing up for their mailing list via the film's website, following the film on Twitter and Facebook–and bring the film to you using Tugg!